Per la Giornata Mondiale dell’Ambiente, GEO, in collaborazione con l’International Innovation Magazine, seleziona una serie di immagini satellitari per la valutazione dei cambiamenti climatici. Le Immagini presentate provengono da satelliti che possono monitorare cambiamenti nella copertura del suolo (es. foreste, campi coltivati, pascoli e superfici acquifere) e cambiamenti nelle strutture artificiali, come strade e edifici. Sono incluse anche immagini spettrali, che danno agli scienziati una visione chiara di informazioni di dettaglio, inclusa la variazione di frazioni di grado di temperatura. To effectively protect our environment, we need to better understand the planet’s natural system so that we can sustain ecosystems and maintain biodiversity. With global warming leading to ever increasing negative impacts – such as droughts, floods and a growing strain on natural resources – it is more important than ever before to take collective action across national boundaries. In this era of exponential data growth, the means to better manage resources are within reach. For the first time in history, plentiful, detailed information is abundant – thanks to the free availability of satellite data through the EU Copernicus, US Landsat and other national programmes. 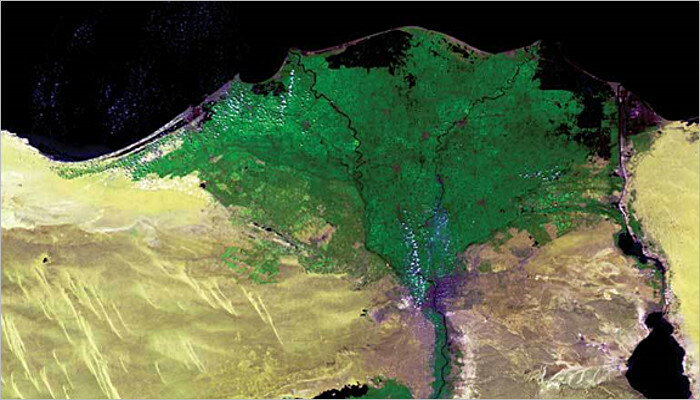 The images presented here are from satellites that can map changes in land cover (eg. forests, crops, grassland and water surfaces) and artificial cover, like roads and buildings in cities. It also includes spectral imaging, which gives scientists a clear view of minute details, including fractions of a degree of temperature change. Satellite data, combined with other Earth observations, provide enough information to assess the situation today and model what may lie in store. This huge monitoring capacity requires robust systems to discover and access the data required to draw conclusions and make predictions. International cooperation built through the Group on Earth Observations (GEO) has increased open data sharing so that all relevant data can ultimately be discovered and accessed by scientists, government officials and other decision makers. By combing data over time, or by comparing data from different sources, intelligent decisions can be made about the impact of climate change on land, water, wildlife and ecosystems. No country can solve these problems alone. GEO membership includes 102 member governments and 95 participating organisations comprising international bodies with a mandate in Earth observations. Together, the GEO community is creating a GEO System of Systems (GEOSS) that will link Earth observation resources worldwide across multiple Societal Benefit Areas and make those resources available for informed decision making.